The War Memorial commemorates those who fought and died in World War One. 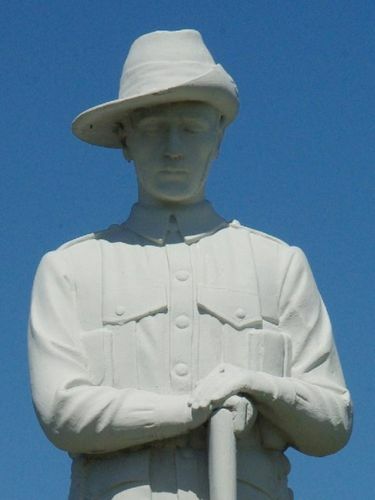 On the monument is a figure of an Australian soldier with reversed arms. The figure was originally dedicated on August 24th, 1919 at the Wolli Creek Tram Depot, Tempe. In 1970, the marble figure was given to the RSL and subsequently placed adjacent to the Club's premises. The figure was painted to cover damage inflicted by vandals. In 2002, a grant from the Department of Veteran Affairs funded a restoration project which involved mounting the statue on a sandstone fronted plinth. The paint was removed from the statue to reveal its original appearance. The memorial is located adjacent to the club.